The Chiefs and Raiders have been going head to head since the 1960s, but the rivalry these days doesn't have quite the same intensity. One of the NFL’s most intense rivalries has turned sour. When the Chiefs visit the Raiders in a series that dates back to the AFL and has been as good as any in pro football, the oddsmakers see Oakland (2-9) getting routed — at home — by Kansas City. Most of America sees it that way, too. Since the Raiders moved from Los Angeles back to Oakland in 1995, there’s been only one season when both clubs had winning records (2016). The rivalry has been less heated since Marty Schottenheimer left as Kansas City coach in 1998 and Raiders owner Al Davis died in 2011. But this gap in success is ridiculous. 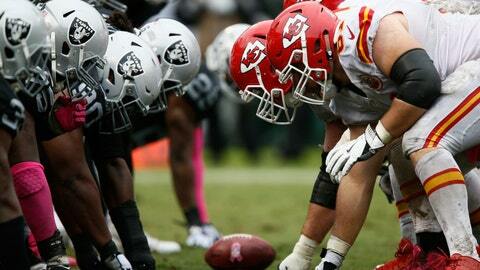 While the Raiders are going nowhere, the Chiefs could lock up a playoff spot in Oakland. It’s a bit complicated, but a Chiefs win and losses by Miami, Tennessee, Houston, Indianapolis, Baltimore and Cincinnati in certain combinations hand Kansas City a playoff berth. Not that anyone doubts one is coming. The Chiefs, who had their bye after losing to the Rams in a classic game in Week 11, have won six of the last seven in the Raiders series. In addition, Reid’s teams are 16-3 coming off a bye. Here’s a weird stat: Oakland stands fifth in the NFL with 34 points on opening drives. But it is third worst with 1.32 points per drive after that.